Australia: Lasers on rugby player in Argentina leads league to investigate | Laser Pointer Safety - News of non-aviation incidents, arrests, etc. The SANZAR rugby organization said they will try to crack down on incidents of lasers being pointed at players. 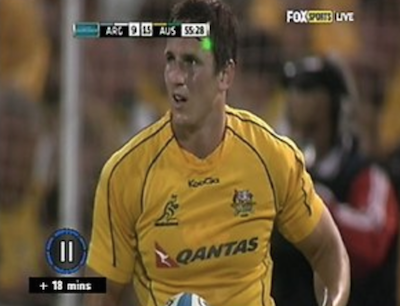 The October 6 2014 statement came after Wallabies player Mike Harris had multiple red and green lasers aimed at him during a match in Argentina. He made seven of eight goals, missing one after he complained to the referee about laser harassment. Lasers were also aimed at Wallabies players during other games between the Australian and Argentine teams. SANZAR chief executive Greg Peters said the organization would investigate.